Do you think ‘yuck’ when you think of eggplant? Many people over cook it until it is mushy. The trick is to cook it until it is soft, but still has a bit of bite to it. This dish is perfect to serve in the middle of the table with rice as a vegetarian meal, with some steamed cabbage or carrots, broccoli, asian green vegetable. Alternatively you could serve with your choice of meat. You could even serve with a pre cooked bbq chicken for something easy. Make a big pot of this eggplant recipe, and use it again as an accompaniment to tomorrow nights meal. Slice 2 large eggplant into large pieces and finely sprinkle with some salt to draw out the bitterness and excess moisture. Throw eggplant in a hot pan (no oil, as eggplant soaks up any liquid) and stir. If it starts sticking, add a little bit of water. Add 1 tbsp of MISO paste (from any supermarket in the asian section), 1 tsp of curry powder, 2 tbsp rice wine or mirin (optional) and a teaspoon of honey or sugar. Add half a cup of water and cook for approximately 10 mins or until the eggplant is soft but it still has it’s shape. Thinly slice some shallot and stir through. Serve on a plate and sprinkle with sesame seeds. 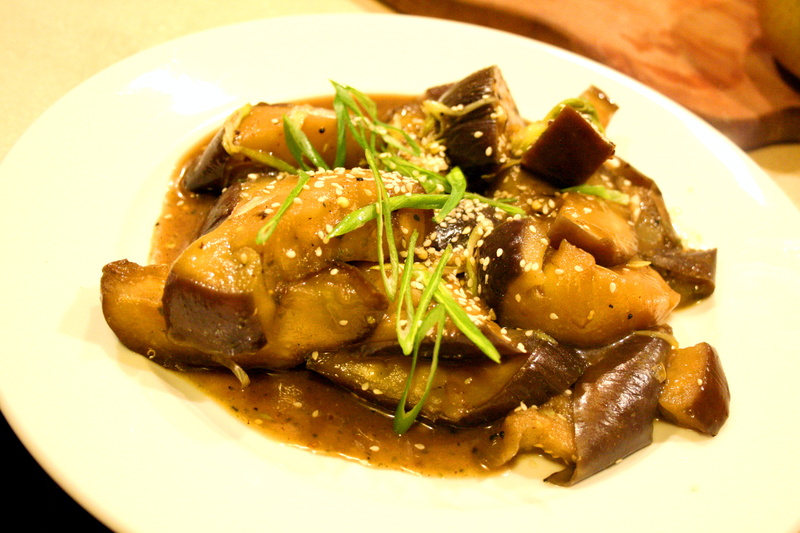 Eggplant is high in fibre which is essential for a healthy digestive system and in the prevention of colon cancer. It is also high in potassium which serves many important functions, most noteably it helps to lower blood pressure. Sesame Seeds are high in vitamin E, calcium, magnesium, iron and tryptophan (which gets converted in our body to the ‘feel good’ hormone Seratonin which is great for our mood). Miso paste is high in protein, with a whopping 2 grams of protein in just 1tbsp, and thought to be protective against cancer. Delicious AND nutritious…definately worth a try! Let us know how it turns out! terriskitchenuk- I am so very sorry. only just saw your message, thankyou so very much! We are honoured! I’ve just discovered how fabulous eggplant is with miso. Can’t wait to try this recipe. It’s delicious isn’t it! Let us know how you go!